A generous 515 square feet provides a luxuriant room for relaxing or entertaining fellow world travelers. The separate living area includes a four-seat dining table, sofa, bar, fridge, and satellite TV. The bedroom features a Queen-size bed, with custom-build bench for storage, and comfortable couch. 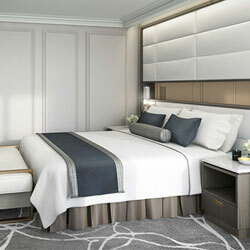 Plus Queen-size beds, with tufted leather headboards are made up with the finest linens. Each suite features a spacious, full-height hanging closet and a separate double-hanging closet, both custom-designed with integrated lighting. 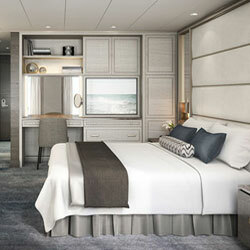 Note: Yacht Suites on Deck 3 are 223 square feet.